Start booking your calendars as this is what we have planned for our main events 2016! Most of the events will happen on the specified days but please keep a look out for any changes in the actual event threads which we will post up at least a month in advance. Charity/Breakfast Run – We are planning a drive in support of an Animal Shelter, We will be collecting donations from our members and hand it over to the shelter where our members will be able to spend some time with the dogs & cats in the care of the shelter. Vdub Camp Fest, Hartebeesport – The VWCSA are official sponsors of the event which pulls crowd of over 200 000 people. We will have a large presence over the course of this event, we arrange an official convoy, we will have a large display stand where our member’s cars will be on display, our members will be entering the pristine show & shine event hoping to take home the grand prize & we will assist in the running of the event. A few of our advertisers have the opportunity to setup stalls at a discounted price if arranged through us, this is a great opportunity to meet various car enthusiasts from all walks of life. Night Dyno - HM Auto, Sebenza – This event over the years has always been well attended, we accommodate over 100 participants and over 300 spectators at this event, There will be an opportunity for advertising stalls where products may be displayed. Gymkarting – Zwartkops Raceway Kart Track - Great drivers prevail in what is a tough day out on the Kart track, It all starts out with a 2 hour Enduro-Kart race with teams of 4 participants, This is followed by a Gymkhana, where participants race their cars on the tight and twisty kart track. VWCSA goes to the races! Street 2 Strip Tarlton International Raceway – The VWCSA will be attending this event which the Tarlton organizers host to take illegal drags off the road and onto the strip at affordable prices so the public can participate in a safe & controlled environment. Night Park off Venue TBC – After great success in 2015 we will host a park off event capable of hosting over 1000 cars, this is a good event to socialize and meet car enthusiasts from all the different walks of life, there will be an opportunity for advertising stalls where products may be displayed. DubRun16 10th year Anniversary Edition – This is our pristine event which everyone looks forward to, We host several mini-events over the days which all starts off with our traditional tape up of cars, We have seen many creative designs over the years and the bar just keeps on being raised as the years go on. In the early hours of Friday morning all participants meet up at a petropoort on the N3 in JHB where the official commencement of DubRun begins, We host a controlled convoy with over 100 cars to the Pavillion Shopping Mall in Durban, Our KZN chapter meet us in Harrismith to join what is the biggest car convoy in SA. We host various events on the Saturday & Sunday bringing the JHB & KZN VWCSA family together and we all compete amongst each other to see who has what it takes to win the various prizes over the course of the long weekend. All participants receive a DubRun pack where all our advertisers generously contribute with pamphlets, products & branded apparel, included in the pack is limited edition DubRun T-shirts and Hoodies which is always well received by our participants, the apparel has become collector’s items amongst our members. There are various opportunities for advertisers to get involved throughout the course of the event. There will be an opportunity for advertising stalls where products may be displayed. PM us to book a spot as there is limited space. Treasure Hunt Various Location – An annual event that has turned out to be a fun filled family day where participants are given clues and activities they have to complete in order to complete this treasure hunt, This event works on the same concept as the Amazing race but since we are all car enthusiasts, you’re navigation skills are required as there is no map to guide you to the finish. Annual General Meeting at The Shack in the Vaal (incorporating our final breakfast run for the year) – This event marks the closure of the 2016 Committee and the elections of the 2017 Committee that will take the clubs ever growing success one step further. Members have their say and all matters of interest are discussed to ensure we are forever evolving and keep our name up at the top as the biggest car enthusiast club of South Africa. Last edited by Firestrm_ZA on Thu Nov 17, 2016 10:26 am, edited 8 times in total. Good Ness me committee, you guys are busy. Awesome work, loving the calendar. Just a small point worth raising. The next weekend starting 24th June is a school holiday until the 18th July, I'm sure people with kids like myself would much prefer leaving during the school holidays? Just an idea.Although the 16th is a public holiday too. Cant wait. For the kzn events. 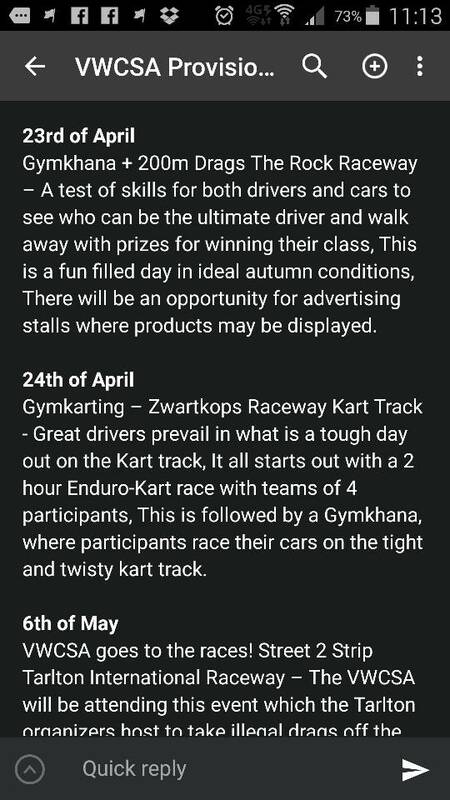 Gymkarting has been postponed to the 24th of April due to the Easter weekend. So we got 2 events back to back in April? Viper wrote: So we got 2 events back to back in April? Yea it is Wikus, Sorry I see for some reason Tapatalk doesn't show the strikethrough. I'll remove it completely from the initial post. What happened to the Hill Climb event. headworks#1 wrote: What happened to the Hill Climb event. Might see it later in the year, but don't hold out for it.